The wild edible berries covered here are found in the Midwest of the US, since that’s where I live. 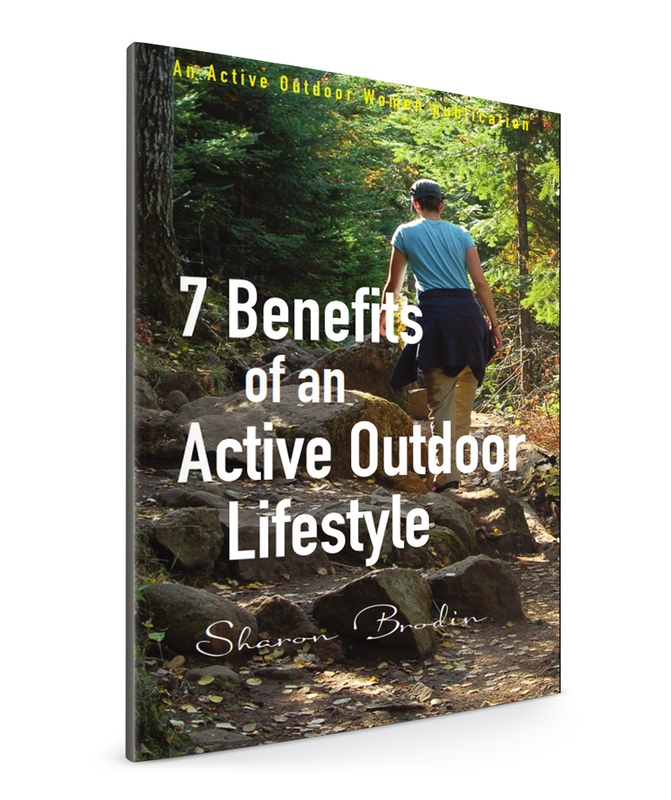 There are so many others, too, but this will get you going on some great snacking options when hiking and camping. 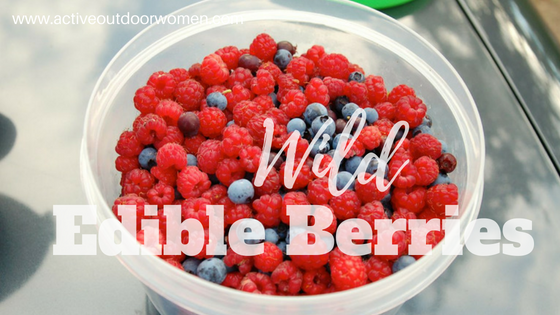 Edible wild berries are wonderful to add to cereal, yogurt, pancakes and desserts. If you know where to pick and bring containers with you, you can even pick enough for a pie. Or just pick and enjoy as you go…unless you’re in national parks or state parks. Better check the rules first! The thing to know if you’ve not picked wild berries before: they’re much smaller—and usually tastier—than their domesticated cousins. Blueberries grow wild all across the colder parts of North America. These small, compact bushes love sun, love rocky soil, and—we found after hitting the jackpot in a few spots—they seem to love the ashy soil post-forest fire. Blueberries grow in clusters as you see in the photo above. 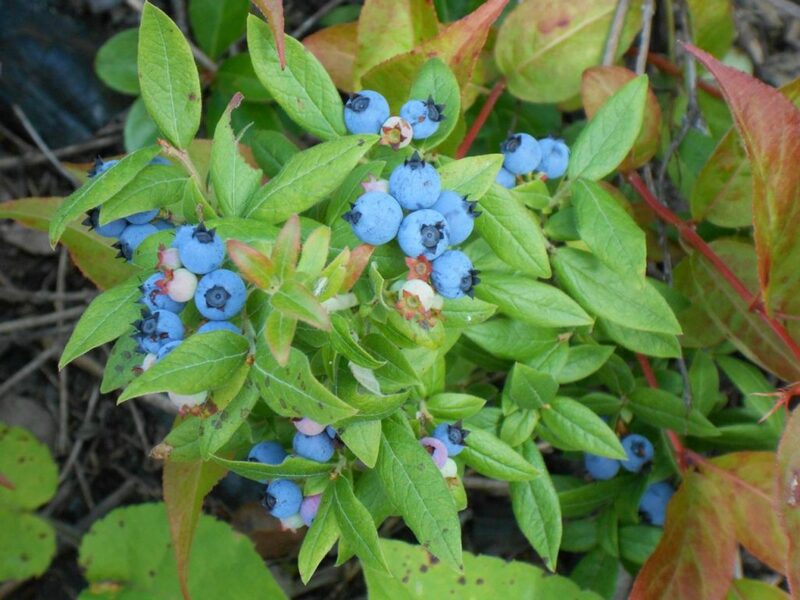 There’s nothing quite as wonderful as stumbling upon a blueberry patch when hiking or on a portage during a canoe trip! As we’ve discovered them, we’ve often gone back with baggies or plastic containers so we can pick more than for just eating at the time. Serious blueberry pickers have a reputation for being very secretive and protective of their favorite spots. So if you question any of these folks, don’t be surprised by their evasive answers! Depending on how far north you are, blueberries ripen mid-summer into late summer. You know they’re ripe when they’re a nice blue. Unripe berries are whitish to light purple (you can see the difference in the above photo). NOTE: Not all blue berries are blueberries, so know what to look for. Start with the distinct “crown.” At least in northern Minnesota, we have other blue berries that are toxic! I’m only including these because they’re edible, as in not toxic. I’ve not eaten them myself because I’ve heard they’re not very tasty. They sure look vibrant on their squat little plants, though! And if you’re ever in a tight spot and need to eat to survive, they’ll help you out. They have the prettiest little 4-pointed white flower in mid-to-late spring (Go to Minnesota Wildflowers and scroll down to Bunchberry). 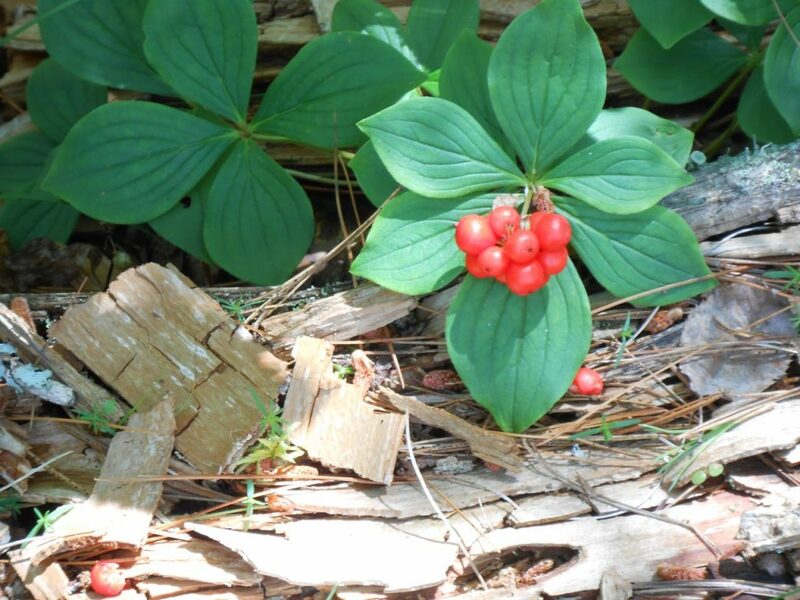 They grow on 5-6 inch plants in shady woodlands, often in large patches. Like blueberries, everyone’s heard of raspberries. These common berries are tangy sweet and just as delicious in pancakes as blueberries are! They grow on bushes 2-4 feet tall, often very abundantly and with plenty of sun. Since the berries hang from their stalks below the leaves, be sure to lift up the branches to find them all. You’ll know they’re ripe when they’re bright red. Serviceberries (also known as Saskatoon berries) grow on bushes that can be just a few feet tall up to tree-size, depending on the variety. They seem to like the same areas as blueberries, as we’ve seen them together often in sunny areas. The berries are about the same size as blueberries, too. They start out red and gradually deepen to dark purple when they’re ripe. Very tasty! Somewhat sweeter than blueberries. I’m sorry I don’t have a good photo of this one, but the best way to differentiate it from similar-looking berries is by its crown—very similar to blueberries. Here’s a page with photos. 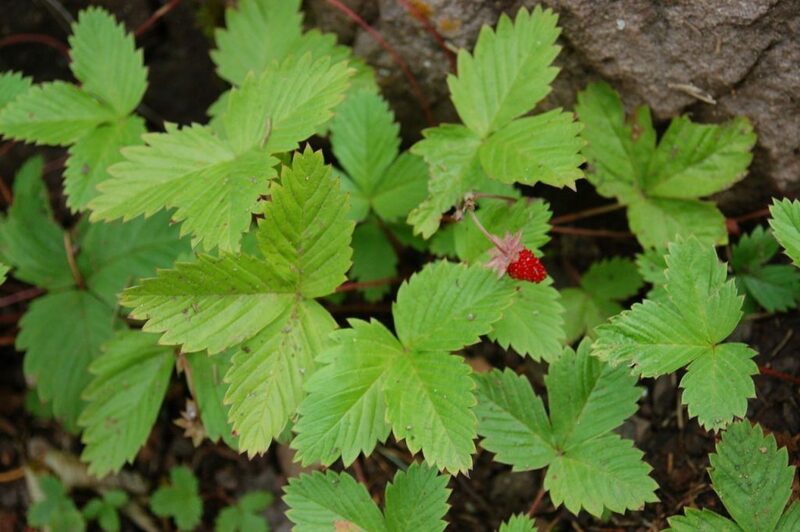 Wild strawberries are a miniature version of their domesticated cousins. Tiny and super flavorful, they make wonderful jam if you can find enough of them! They grow on tiny 3-leafed plants that are just a few inches tall, and love sun. The berries hang down so they can be hard to spot unless you lift the leaves up. They ripen in mid-to-late spring, earlier than most of the other berries. 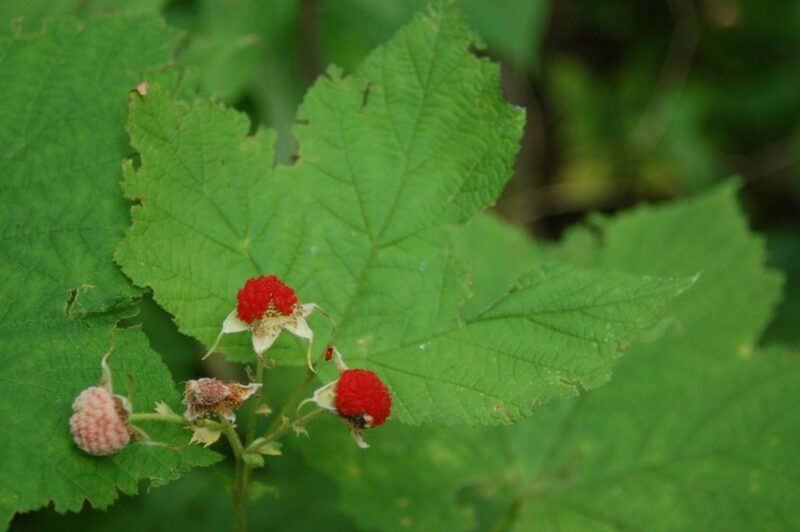 Thimbleberries look sort of like raspberries except they grow up above their leaves instead of hanging down on the short stalks. The leaves are broad and large, as seen in the photo above, and look like maple leaves. They’re shady woodland dwellers. 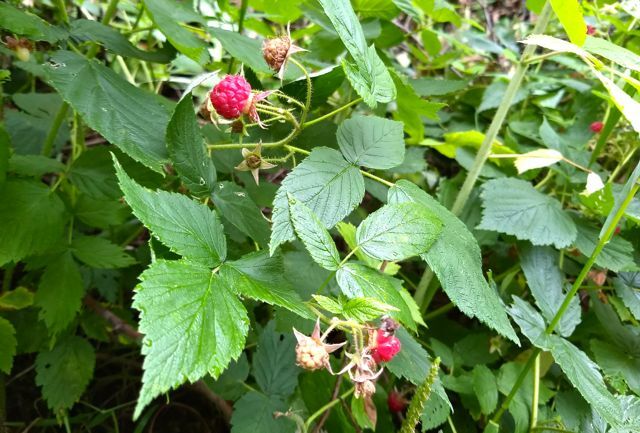 The berries aren’t quite as flavorful as raspberries, nor are they as plentiful on each plant. But they’re easy to spot and grab. They start almost white and deepen to bright red when ripe, in mid-late summer. 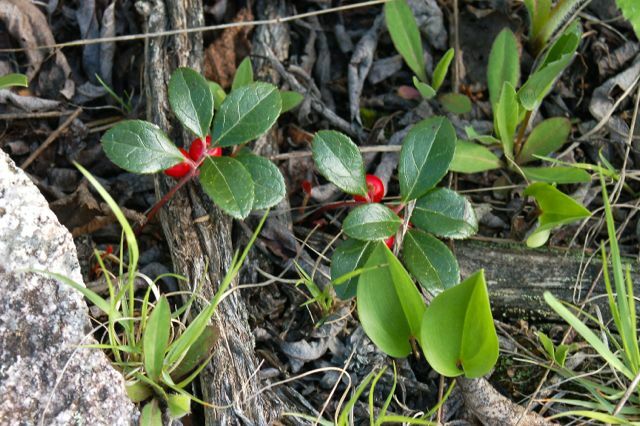 The waxy leaves of this little plant have been used for centuries in tea and medicinally. They grow and spread in wooded areas. I went camping with a friend just last week—blueberry season in northern Minnesota. So we chose a hike I knew was loaded with bushes, brought along containers for picking and brought along pancake mix. 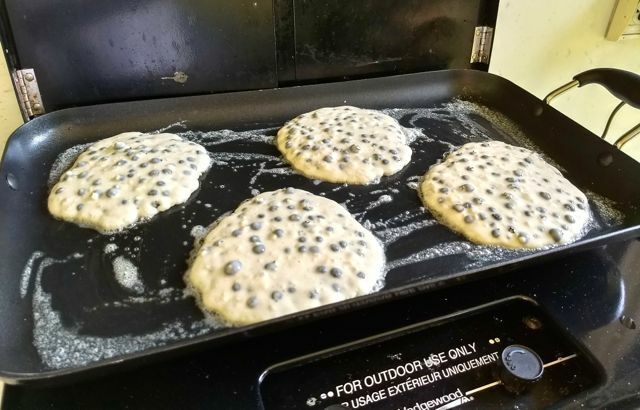 What a wonderful treat to load up the batter with these delicious berries for our breakfast the next morning!